One of the comments that I got was from Cheryl Griffis. She asked if I had ever swapped the orange juice out for pineapple juice. “GENIUS,” I thought. So I got in the kitchen and set out to do just that. I made a few tweaks to capitalize on all that delicious pineapple flavor and boy did it turn out amazing!! I think this one might even edge out the orange juice version, but I’ve always been a huge pineapple fan. 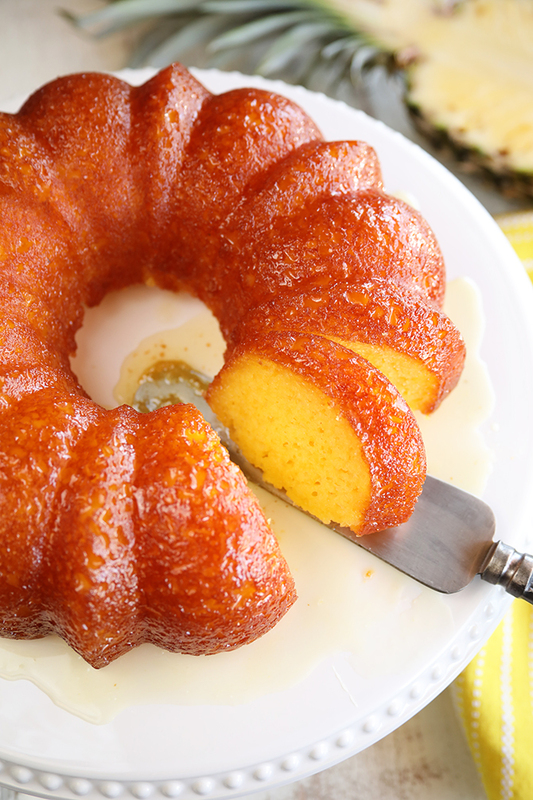 The super moist cake is infused with pineapple flavor in the batter and the butter-pineapple glaze that it gets soaked in amps that pineapple flavor up even more! I took these photos and may have eaten 2 slices… okay, 3. If you’re a fan of the orange juice version and love pineapple, I bet you’re going to devours this. Seriously. Y’all enjoy! 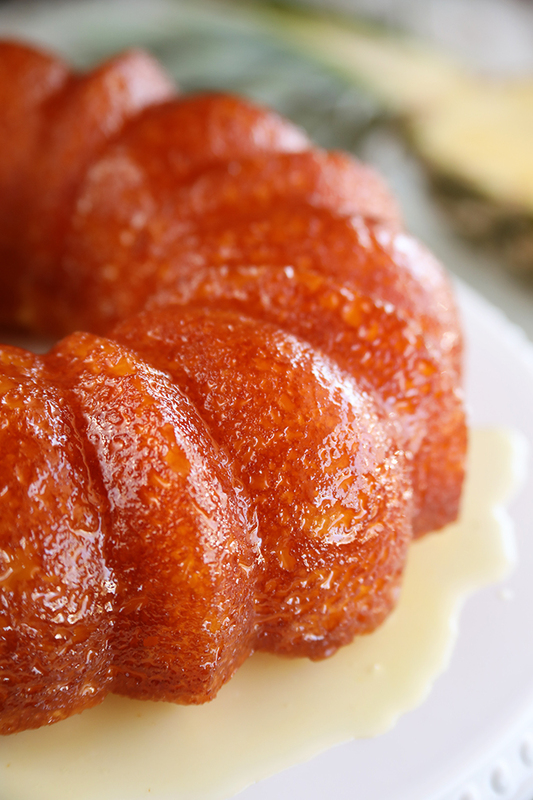 Preheat the oven to 325°F and grease and flour a 10 to 12-cup Bundt pan. Use a skewer or toothpick to poke holes in the cake. 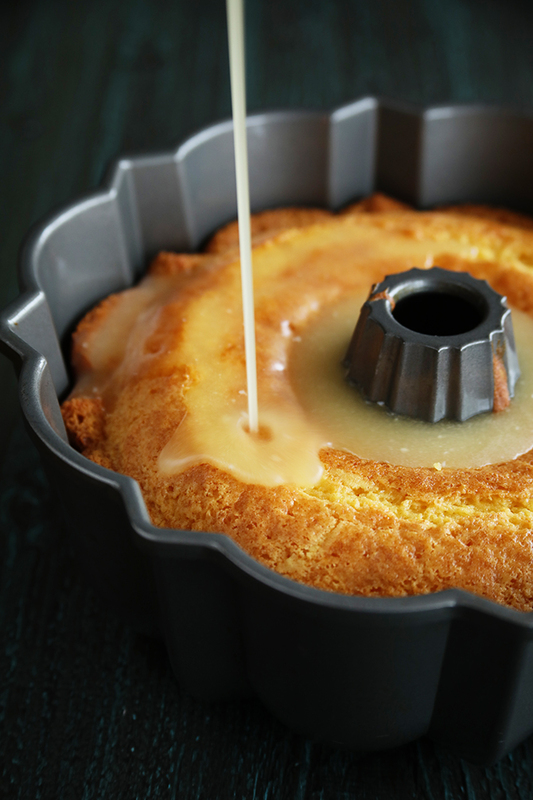 Pour the warm glaze over the cake while it is still in the cake pan. It's going to seem like a lot of glaze, but just keep pouring. Allow to cool for 15 to 20 more minutes, or until the cake is cool and most of the glaze has been absorbed, then invert the cake onto a serving platter. After much testing, I've found that Duncan Hines cake mixes do not work with this recipe. I prefer to use Betty Crocker or Pillsbury. This makes for an incredibly moist cake. If you feel like that might not be your thing, feel free to use less of the glaze. No pudding in this one? Not on this one. I think it covers up the pineapple flavor. I really don’t like pineapple in chunks, slices, or crushed even,but have always loved pineapple juice! (Maybe it’s a texture thing?) Anyway, this cake sounds out of this world! I definitely must try it….thanks for sharing! This is perfect for you, then! I sure hope you’ll enjoy it!! Can this be made in a different size pan? I’ve only ever made it in a Bundt pan, but as with most cake mix cakes, it will fit into a 9×13 without any problem. Hope you’ll enjoy it! You can bake in a tube pan large enough to hold batter. That’s what I have used for years . I have also used Lemon Jello when I made the lemon version and was out of the instant pudding. This cake has always brought rave reviews. Do they make Pineapple Jello? Yes they make pineapple jello. Yes I buy pineapple Jello all the time. Try Walmart or most any large grocery chain. Do you use sweetened or unsweetened pineapple juice? I used Dole 100% pineapple juice. I just thought I should tell you, Stacey, that I blame my inability to lose weight on you! Every time I think I might be able to make the numbers on my scale go down, you showcase an absolutely yummy dessert and my (almost non-existent) will power disappears! 🙂 Seriously, this sounds sooo good! I think I need to make it and take it to some kind of social gathering so I don’t eat it all! Beverly and Stacey… you two cracked me up with your comments! Beverly, my willpower is totally nonexistent too 😬 I don’t live to eat, I simply enjoy food 😋 IMO, it’s not an addiction… if I had to be kept alive by some other means, then I guess I would adjust in time. So while I’m on this 🌎 I continue to enjoy the foods that heighten my tastebuds and make me rub my tummy with delight! This is a keeper….and I’m baking one, soon. 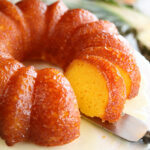 I use Pineapple cake mix…it gives it even more pineapple flavor! Great idea! I’ve not seen that around me lately. Read this recipe, made it using DH Butter Cake mix. Only adjustment was I baked it 40 minutes. Batter was very thin but baked well. Cake was very light and delicious. How would you convert a scratch cake recipe to make this? Box cakes have way too many chemicals. You wouldn’t recommend it because? Most homemade cake mixes call for milk and require the dairy as part of the chemistry makeup. Replacing the milk with juice would cause a change in texture and possibly even lift. Most boxed cake mixes have some form of powdered dairy in them and therefore only call for water. Replacing the water with juice won’t affect the end product or texture. Try adding powered mile to the dry ingredients first then add the juice. This is a very old bakers trick. It has always worked for me. 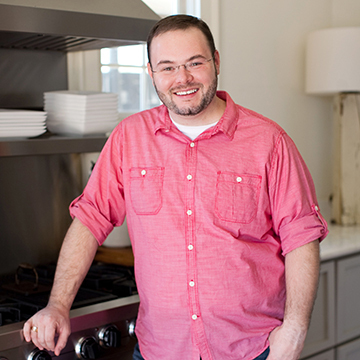 I found a really good on on Epicurious. I’v e been making and apple cake for years that uses oil, also carrot cake. Can’t wait to try the epicurious home made version. Don’t like chemicals. Will a 20 ounce can of pineapple yield enough juice to make this or do I need to buy a can of pineapple juice? Probably not. I just used a can of juice. I hadn’t read all the comments, and I bought a plastic jug of Libby’s unsweetened pineapple juice for the cake. I don’t like the canned kind because it always tastes like metal to me. Anyway, the cake turned out beautifully, but was extremely sweet. I’m glad they cake turned out great for you, Nora! I would like the orange cake recipe that was included. Thank you. My church youth group has a big bake sale the day before Easter and I think this will be one of the cakes I take for it. Looks absolutely DELICIOUS!! When I make Pineapple Upside Cake I always use pineapple juice instead of the water called for in the recipe. This looks so much better than that. b I’ll have to find the one make with orange juice since I apparently missed it when it was posted. THANK YOU!! If the cake fell like that, it probably wasn’t cooked through. I’ve had quite a few comments about cakes falling or not rising enough. After doing some research, I came across lots of folks who are having trouble with Duncan Hines cakes mixes since a suspected formula change in 2017. I might suggest opting for another brand, just in case. After much testing, I did confirm that the Duncan Hines cake mixes do not work with this recipe. However, I had great success with both Betty Crocker and Pillsbury mixes. Yes they do sell 🍍 pineapple jello i got it from Meijer. I’ve done a similar thing with lemon cake mix and lemon glaze in a 9×13 pan. Always a family favorite. I am definitely going to make this! I liked the fact there is no pudding mix in it I try to use as few packaged ingredients as possible! I won’t do a recipe that has putting mix in it! I think when I make this, I will add coconut flavoring to it. I make pancakes with coconut flavoring in them and a slice of pineapple in the middle. They are wonderful. I just made this cake and it is A-MAZING! It is so good that I don’t think I can trust myself to be alone with it—luckily I have two teenagers that will devour it before I can do too much damage! 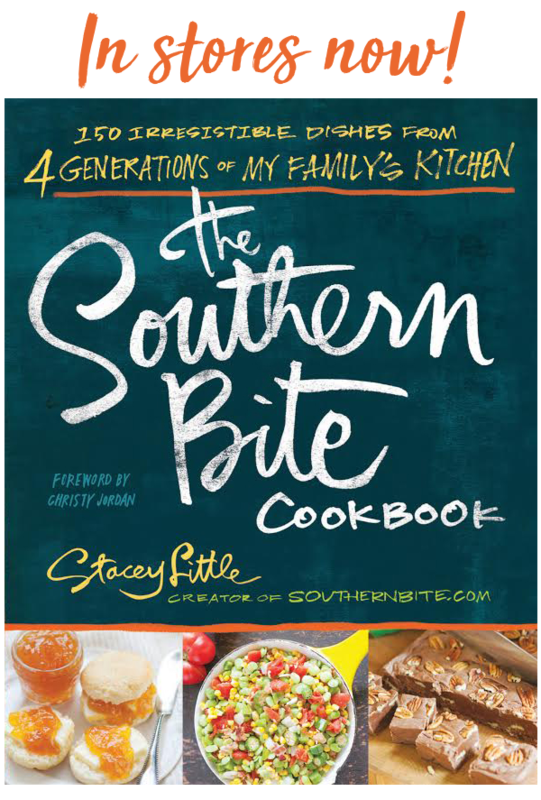 Thank you Stacey for another winner! Ha! So glad it turned out great and that y’all enjoyed it!! Do you think you could use simply lemonade and make a lemon cake? It’s probably worth a try. Can I use margarine or will it mess up the cake? Stacy, a great recipe I baked it. It was so moist and it was devoured. Thanks so much! Awesome! I’m so glad it turned out great for you! Just made it….smells amazing and the crumbs taste awesome. But it did stick to the pan after cooling for 20 minutes and glipping it over. Ugh. I greased it very well. Next time maybe grease it even more???? Seemed cooked well enough with tan edges. Maybe try flipping it a little sooner. Can you explain to this novice baker why the glaze is put on the bottom of the cake rather than drizzled on top to run down the sides? This is really more of a soak than a glaze, but calling it a soak might confuse some folks. Mine did the same thing- it rose all around the sides but not in the middle. It was done however and tasted great but definitely not the way it was supposed to look. It also stuck to the pan. I noticed a few others said theirs fell as well. What can we do to avoid that happening again? Do y’all mind sharing with my what cake mix brand you used? I’m working to figure this out, Linda, as I’ve had a few folks mention this same issue. I’ve made this cake 5 or 6 times in the last month and haven’t been able to recreate the problem. Do you mind telling me what brand of cake mix you used? I was in tears when I saw this. My late aunt used to make a cake almost identical to this. It’s what she was known for in our small town. I never got the rececipe from her before she got Alzheimer’s. I remember her cooking her sauce on the stove and being in awe of her pouring it over a hot cake. We loved when she made us one. She always made hers upside down with pinnapple slices and cherries. Oh sweet memories❤️ Thanks for sharing. I just love that this brought back some sweet memories for you! I’ve not tried freezing it. Thank you for the warning about it seeming like a lot of glaze. If I hadn’t read that up front, I would have been saying “OMG what have I done?” HA! Thanks for posting this. So simple and yet so delicious. I am sure the fam will be begging for this one again and again. Ha! So glad y’all enjoyed it! It’s certainly one of our favs! Cynthia, Do you mind sharing with me what brand cake mix you used? I made this cake today and it didn’t seem like it rose in the center. What did I do wrong. Then after pouring the glaze on it the cake became very mushy not good at all. What brand cake mix did you use? Hey Debbie! What brand cake mix did you use? Have you tried putting pineapple in food processor and making the icing with that ? It shouldn’t change it too much. My wife made this for me yesterday after I sent her the link from facebook…I had a piece while it was still warm with some dark roast coffee. Seriously, its my favorite cake now. So glad to hear that, Rob! Now I’m wanting some too! 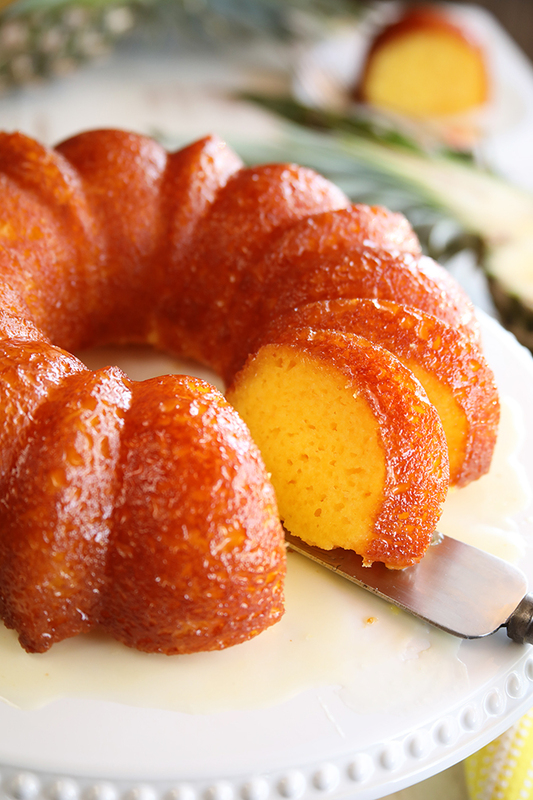 can a can of pineapple be used in cake and the glaze? Should leftovers be stored in the refrigerator? If you’re keeping them longer than a day or so, yes. My granddaughter & I made this cake a few days ago. We couldn’t wait to taste it, but to be honest we really didn’t care for it. Maybe it would’ve been better if crushed pineapple was added to the batter, & maybe less butter in the glaze. I made this a couple of weeks ago. It was very good, and very moist, but not as much pineapple flavor as I thought it would have. I followed the recipe exactly. I was wondering also if adding crushed pineapple to the batter would work. Or maybe a little bit of pineapple extract, I guess there is pineapple extract available. What do you think? I made this cake today and it didn’t rise and THEN I saw the notes where it said a Duncan Heines cake mix doesn’t work. Went to the store and bought a Pillsbury cake mix and started over. My glaze seemed to look like pure liquid instead of a glaze. I melted the butter first in the microwave and added it to the rest of the ingredients and warmed it up on the stovetop. Is it supposed to be of a liquid consistency instead of a glaze??? It’s still cooling so I haven’t tried it yet. Yes, it’s really more of a soak than a glaze – think of it like a rum cake soak. Can this be frosted over with buttercream frosting? It’s for a 6 year old’s birthday, so she cares about the way the cake looks. I care about how it tastes and this looks delicious! Oh, and also in two layers with a pineapple filling in between? Thanks, Lashonda! Unfortunately, I’m not sure this one will hold up to frosting very well. It’s super moist and I’m afraid the frosting will just drip right off. 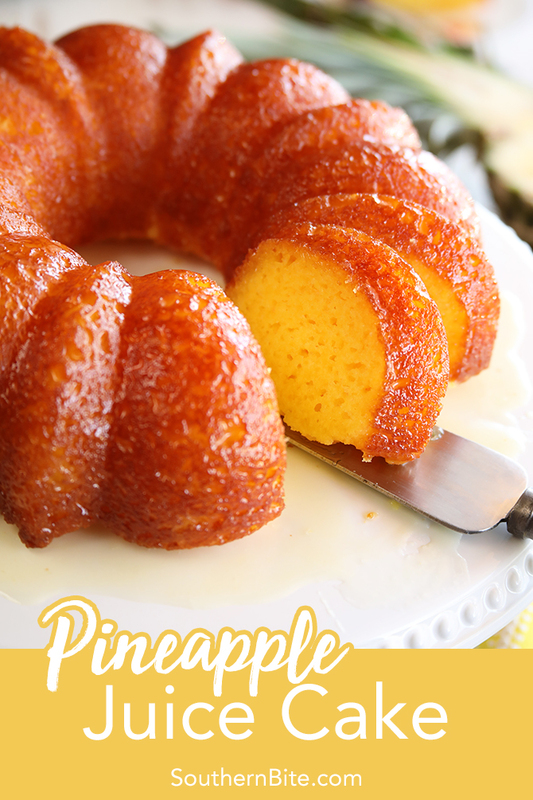 Use pineapple cake mix for even more flavor! 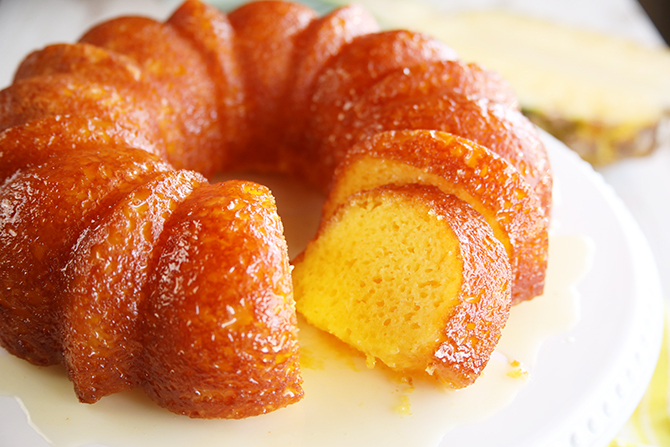 I’ve only ever done it in a Bundt, but you’re welcome to try it. Theoretically, it should work. Stacey… is vegetable oil a must? I always use canola for baking, and EVOO for cooking. I will buy vegetable if you feel it’s best for this recipe. Thank you! I have one in the oven right now. I made some additions and once it’s baked I will get back to you and let you know, but I am baking at 350 as I do all my Bundt recipes. I, too, was wondering about using crushed pineapple in the cake batter – maybe instead of the pineapple juice? Or maybe 3/4 C crushed pineapple and 1/4 C juice to ensure enough liquid? Has anybody tried it?